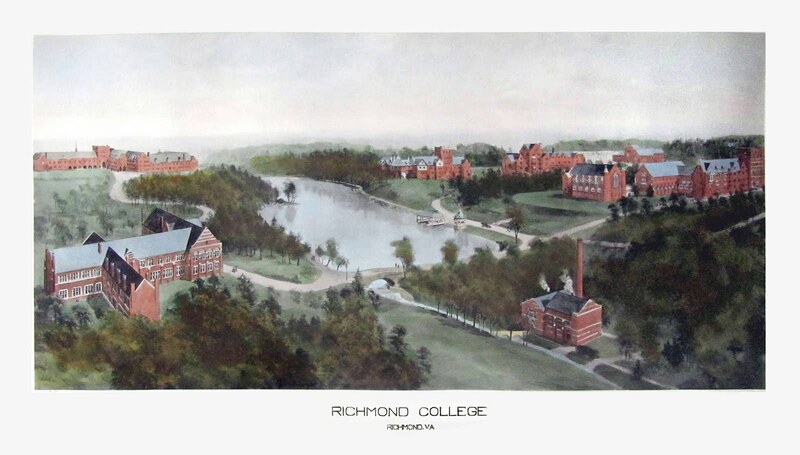 At the turn of the century, the accomplished landscape artist Richard Rummell (1848-1924) painted a panoramic bird’s-eye view watercolor of Richmond College, now the University of Richmond. From this watercolor, a copper-plate was engraved and a limited number of pulls (engravings) were distributed. From the early 19th to the first part of the 20th century, a scenic park with various amusements including the beautiful Lake and a Playhouse on the 350 acres that the University of Richmond calls home. Rummell's vivid watercolor of the emerging new school is of landmark importance to the school's history as it visually commemorates the transitionary period through which the University moved from the city's historic Fan District to the West End. While the significance of the location change is undoubtedly a paradigm shift in school history on the surface level alone, it further signifies the most important step in shaping what the University is today. That is, the birth of Westhampton College for women, and the change from the all-male Richmond College to the co-ed University of Richmond. While Rummell occasionally incorporated planned yet unfinished structures in his series of College Views, the Richmond College landscape is definitely the most intriguing in this sense. Likely due to the fact that the University was undergoing an intense period of physical change, several bulidings appear in different locations from their current foundations and one never existed as plans ultimately fell through. A church, similar to present-day Canon Memorial Chapel (1929) stands where Boatwright Library (1955) now prominently resides. Meanwhile, an academic hall bearing some resemblance to the Modlin Buliding and Center for the arts (1968, expanded in 1994) stands between today's Chapel and Gottwald Science Center (2005). Of course, the view is easily recognizable with Westhampton Lake (complete with a swim platform) in the center and a variety of structures that still stand today dotting the picturesque campus. North Court (finished in 1911) appears on the left side of the image in the Campus' southwest corner and was at the time named the 'Westhampton College Building.' Across the lake from North Court stands Thomas Hall, completed in 1913 and named after James Thomas, Jr., a Richmond Tobbaconist. Thomas was one of Richmond's first millionaires and a member of the Richmond College board of trustees at the time. Moving clockwise, Jeter Hall is the next building to the north of the lake. Jeter was the first dormitory completed (1913) and was appropriately labeled 'Dormitory no. 1' at the time. Additionally, it was the first to don the school's patented "Collegiate Gothic" style and has served as a template for most of the campus' other construction projects though the years. The Stadium (later First Market Field) lies between Jeter and the refectory, which was re-named Sarah Brunet Memorial Hall in 1924 after the generous benefactor whose name continues to reside on the building today. Ryland Hall sits to the east, next to the proposed Chapel. This academic building was completed in 1914 and named for Robert Ryland, Richmond College's first president, and his family, who stayed closely involved with the University for generations. Finally, the Steam Power Plant (1914) sits on the bottom right of the painting, adjacent to a train car full of coal. The Plant continues to provide hot water and steam for the campus' HV/AC systems today. The University of Richmond Rummell view is printed on fine woven paper from the original 1915 engraved copper-plate by a master printer. Coloring is performed by a team of expert watercolorists, and framing is completed in-house with acid-free mat and high grade plexiglass that fits all museum specifications.